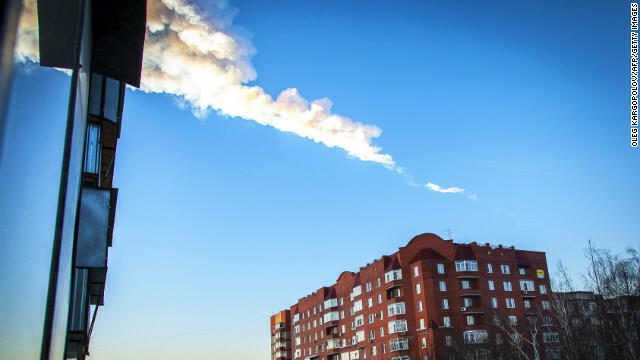 The trail of a falling object is seen above a residential apartment block in the Urals city of Chelyabinsk, on February 15, 2013. A heavy meteor shower rained down today on central Russia, sowing panic as the hurtling space debris smashed windows and injured dozens of stunned locals, officials said. (CNN) -- By now you've heard the news about the meteor that caused an enormous explosion in Russia. Officials say up to 1,000 people were hurt. Most suffered minor injuries. Once it was clear Russia was not under attack, the Internet relaxed and slyly glanced around. is your normally healthy reservoir of space jokes suffering a drought? Not to fear. If there's one thing Twitter excels at, it's humor in the face of calamity. Here are 11 funny tweets about the meteor we wish we'd thought of. Mobile users click here to see the Storify.